I spent the other weekend working on this guy as a follow up to the Heroes of Armageddon project. After talking to my friend about the color scheme, he pretty much gave me free run with the model. 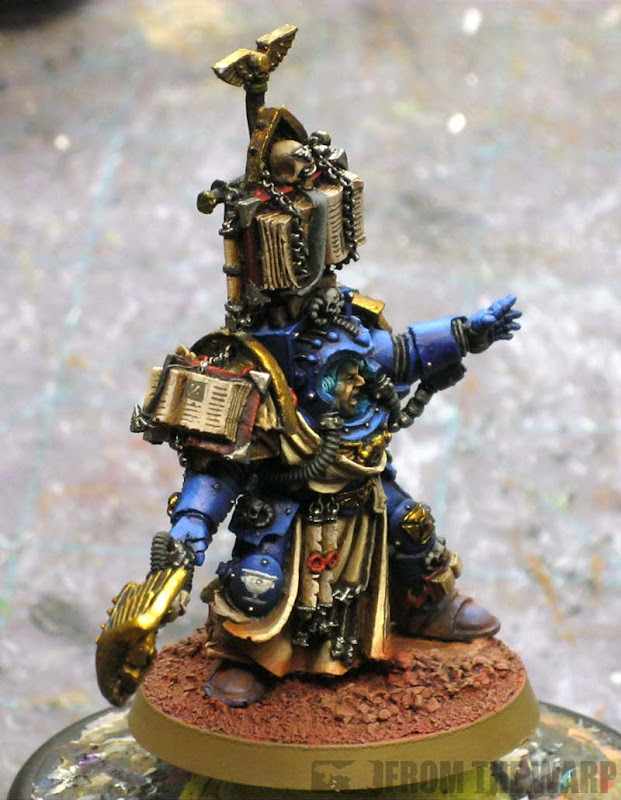 We decided to go with the standard blue Librarian color scheme with this guy as it marks him for who he is on the tabletop and the blue ties in nicely with the rest of his army as well. 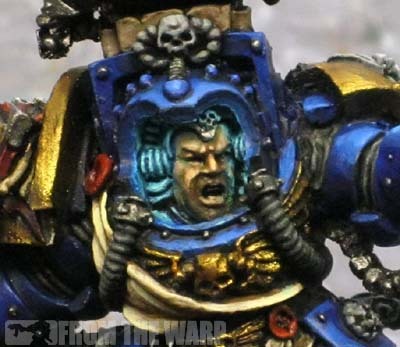 I tried to use the more complex zenithal approach I guess you could call it that I used on a previous Librarian I painted before. You all know what I went through to get him ready for paint being that he is a Finecast model. Once I had him set, I actually started to run into problems painting him as well. Not with the amount of detail, but with what colors all the little things should be so that he comes together in the end and doesn't look like a rainbow of colors. I wanted the robes to contrast from the armour so I made them a tan color, but didn't want the scrolls and such to blend in with the robes so I chose a slightly different tan for those. And it wasn't just the base color, but how I shaded and highlighted them as well. I ended up using the official GW version as sort of a guide to what I would paint what in terms of colors. I just decided to mute things a bit and stay away from the cartoon look as much as I could. Originally, I'd painted his whole face and chest area to represent a strong glow from inside his hood. Enough that it spilled out onto his surrounding armour as well. I even went so far as to make the cables running up the sides of his chest look like they were glowing too. Once I'd spent a huge amount of time on it and had it looking just right... I scrapped it all because it was just too much glow. I wanted the effect to be there to enhance the model and not overtake it like I'd done in my excitement to do it well. So I scaled it all back, painted his face back onto him and removed the glow from the majority of the model. In the end, all I left was a bit of glow around the sides of his face to show the effect. I think this is much better as it adds to the character of the model without going overboard and becoming a focal point. Even with all that the model has going on, I want to give him that extra touch here and there. 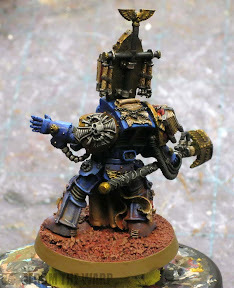 That meant squeezing in a small icon on his right knee pad along with some trim detail on the inside of his tabard. I added some script to the pages of all his books for good measure too. One thing I've found when adding script like that is to stay away from using black. If you use black, it draws a ton of attention to the element due to the high contrast most of the time. Instead, I use a medium grey color that has just enough contrast to stand out, but not so much that it draws your eye right to it. I've found this to give me a much better result in the end. The base was painted to match the rest of my friend's army. At first, I was worried about the contrast between the red and the blue. In the end, I think it's one of my favorite bases to date. It doesn't have much detail to it, but the red makes for such a nice change of pace. It's not just another grey battlefield base. I did try and mute it a bit with some washes and by adding tan into the highlights. After that. I did few quick passes with some weathering powders to tie the model to it. There was no way I was going to do a red dust type basing and not show the effects on the model. I used a couple colors from Secret Weapon Miniatures and brushed them along the lower portions of his legs and the bottom of his tabard until I had what looked like a good result to me. In the end, I think this guy came out fairly well. I love all the color he has on him, but it's not way over the top. I guess that's what makes me the most happy. I was able to get the scheme I wanted and have it look somewhat believable... for 40k that is. I think the light effect inside the helm works better because confining it to a small area makes it quite subtle. I can see how it might have overpowered the model and confining was a good call. I had the same problem with where to place the chapter badge when I first painted this figure and also settled for the right kneepad. 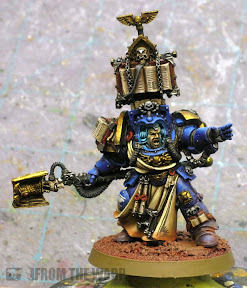 Absolutely love the book / parchments on the model. Sendraks: Thanks, you should have seen him when the whole front was glowing. I wish I'd taken a pic or two now to capture it... it was silly looking. Bully: Thanks, I actually think they are a weaker part of the model. Nice, nice, nice! I have to agree with Bully- the book on his standard rack looks sweet! Awesome work as always Ron - I especially appreciate the tip about not using black for linework on books and scrolls. 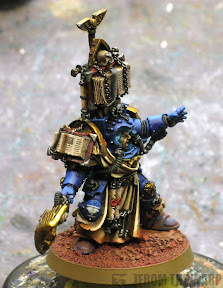 The grey does look better - I'll have to give that a shot on the Thousand Sons I'm working on. Keep up the great work! deathkorps: Thanks, I didn't realize how much detail was in there until I actually started painting it. I always assumed it was just a book up there, but it turns out there are a handful of elements up there. Mordian7th: Hope it helps. I just try and make sure I have a slightly darker color for the text these days. Anything more and it just draws too much attention. I can't wait to get my hands on one of these! As always, looks fantastic, Ron. Krisken: I'm hoping GW will improve the casting process by the time I get around to buying one for myself in the next year or so. I'll be adding this guy to my army for sure. Awsome stuff, i paticuarly like the edging on the back of the tabard, not something i noticed straight away but adds a nice touch. I recently bought one of these as i love the look of terminator armour but love the extra flair on librarians. He's currently under-coated, primed, and washed. After looking at the amount of detail on the model and wanting to do a good job of it, i have put him on the back burner for a while, while i improve my painting skill. Murray: I love the look of this model as well. He's one of my favorites all around. Don't let the detail on him scare you away. It might seem like a lot, but it's not hard to do once you get started and work on a section at a time.